Until 15th August 1947, the City of Bangalore comprised of two separate areas, Bangalore City (Petta) proper which was administered by the Maharaja of Mysore, the other area was known as a Civil and Military Station (Cantonment), administered by the British Government through the Resident. (Click on the Blue coloured 'hyper-text' below paragraphs for photographs) If one were to go back to the late 1920's it's geography consisted of Shoolay, The Parade (later Parade Grounds) , Northern Suburbs (St. John's Hill, Fraser Town, Cleveland Town, Benson Town, Cox Town and Richard's Town), Eastern Suburbs (Ulsoor, Knoxpet and Agram), Southern Suburbs (Richmond Town, Langford Town and Austin Town). Even today these Suburbs still exist except perhaps Knoxpet which was converted into Murphy Town. The residences of the "Elite" of Bangalore were situated in an area known as "High Grounds", and were not within the Cantonment limits which adjoined them on the Eastern side. It was for a visitor a very difficult question to decide which was the best Suburb in the City of Bangalore to reside in. Much depended on the "purse" and "tastes" of the individual. Russell Market and Blackpully was part of the Northern Suburb of the Cantonment. The outskirts of the City were open, healthy, and the houses prettily built, well suited for people who desired to lead quiet and retired lives. It was however a disadvantage being far from places that matter. There was much gaiety in the areas closer to the main Schools and Colleges, Clubs, Institutes, Theaters, Shopping Centres, as this was the "Social" make up of the City. Because of the cool weather, people used to take drives in open carriages through the City, enjoying the scenes of beautifully laid out gardens. Parks were found in a number of places, some of them had Bandstands, where the Armed Forces Band played every week. Noted shopping centres in the 1920's were Commercial Street, South Parade ( now referred to as M.G. Road ), St.Mark's Road (the shopping block was what is now India Garage), and Brigade Road, all near each other. Commercial has still kept it's remarkable business for all classes of people, and one could get practically anything at these places. One could find the European shops on South Parade, a few on St. Mark's Road and Brigade Road. There was an Evening Bazaar and a Gooj where one could pick up all kinds of commodities like used clothes, cameras, and almost any imaginable article, some almost new and at about one-tenth of it's original price. The Gooj even today, is still a very interesting place to visit, but one has to keep an eye on one's purse and also not be tricked into buying some real junk. Photographers were situated around South Parade, like Bangalore Photo Stores at No.4, South Parade, Picture House, No. 2, Brigade Road. Some of the cameras were the Amateur Cine-Kodaks and Cine-Codoscopes for taking Home Movie pictures. Many a visitor needed their services to take back some of the memories of Bangalore, and some of the photos taken in those days are still hanging on many a wall in silent testimony of the good workmanship and products. Let's take an amble starting from Shoolay, which is perhaps the most central of all the Suburbs. The northern area contained several prominent buildings, and palatial residences of Europeans and Anglo-Indians. Some called it the "Chowringhee" (this is a reference to a prominent place in Calcutta) of Bangalore. Some of the landmarks were St. Patrick's Cathedral (redesignated as "Church"), which was situated on Residency Road. The Cathedral was built in the form of a Latin Cross and the main portion seats 800 and the two wings around 200 people. Relics of the True Cross and St. Justin the Martyr are kept here. The building has a very imposing facade over which are the words "Hoec Est Domus Domini" which means " The House of the Lord". The Fourteen Stations and Altars were of exquisite beauty and workmanship. Although today the interior architecture has changed considerably and the beautiful Main Altar replaced, some of the old Side Altars still maintains some of their original beauty. The Cathedral was erected in 1844. The Church was redesigned and consecrated on 12 November 1899. Attached to St. Patrick's Cathedral is the St. Patrick's Orphanage ( also known as St. Patrick's Boys Home) and School. This Institution was meant for the children of European and Anglo-Indian parents who were in destitute circumstances. It was opened in 1893. 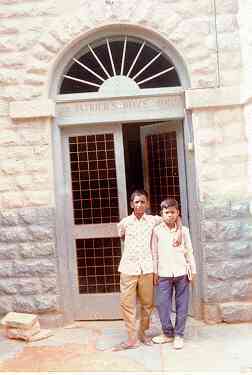 There was accommodation for 150 boys and was the largest in Bangalore. The boys were lodged, fed, clothed and educated free up to the Middle School Standard. Poorer boys of the locality also attended the Day School and even received free mid-day meal and clothes from the funds. The Boys were given a good all-round education. Rev. Fr. Antoine Marie Tabard, was very much involved in the building and collection of funds for it's construction. To the south of Shoolay one would find the Church of the Sacred Heart with it's very old cemetery for Priests, Soldiers and Europeans. 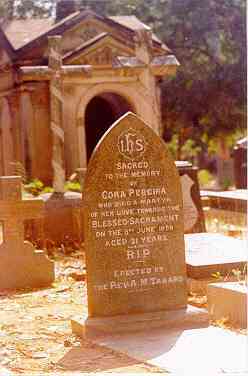 The Priests of the Paris Foreign Mission were buried in this cemetery. Today, sad and unfortunately, only the Priests' Cemetery remains. The old Cemetery was leveled out and some of the old grave stones can be seen in parts of the steps around the Church. The Parade (or Maidan) as it was called, is nearly three miles in perimeter. The roads from the West of the Parade branches off through Cubbon Park called the "Pears' Ride" another branch was called the "Rotten Row". The military authorities have taken pains to keep the Parade in fine condition. Turfed slopes, paths for pedestrians, shady trees, stone seats, a garden opposite St. Mark's Church (Gandhi Park today), gave great joy to the residents of this area and outsiders. The troops paraded here for Reviews, Inspections and on other ceremonial occasions when the Resident, the Government Officials, the "Sahibs" and their wives turned out to witness the maneuvers and hear the pipers and bands. On the Northern side of the Parade is Cubbon Road, and the B.R.V. Theater, Brigade Staff Offices, St. Andrew's Chruch, Baird Barracks, and at the East end of it is the Wesleyan Church (East Parade Church) and the Soldiers Home, and further East one comes to the Holy Trinity Church. The Southern side of the Parade one finds the South Parade (M.G. Road) . 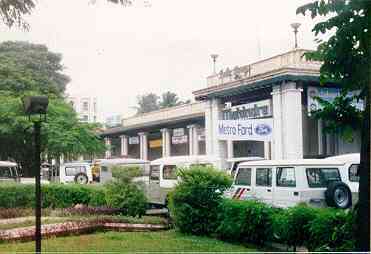 The South Parade was an area where business was conducted in Bangalore. 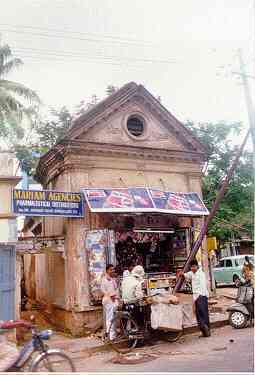 A few buildings that existed in the 1920's were Whiteaways', Funnells' Restaurant (now the premises of the Deccan Herald), Empire Theatre*, Higginbothams*, Wrenn, Bennett & Co. Ltd (the best ladies garments and millinery displayed here), Baccalas' Restaurant. Near the Mayo Hall is a cross road called the Commissariat Road, where one can find the Ebenezer Chapel, belonging to the Bangalore Free Communion Baptist Church. (The Church was formed on 26th November 1854 and the building Opened on 18th August 1867. It was formed by the late Rev. T.C. Page of Madras. On 30th March 1856, Mr. Marsden, became its next Pastor. Besides watching over this Christian Community, Mr. Marsden devoted a considerable portion of his time to evangelistic visitation amoung the residents of Bangalore, particularly the Military, of whom there was always a very large number at the Station). 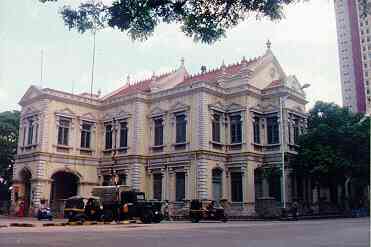 At the Parade's Western end were "The Shaftesbury", Oriental Buildings*, Bible and Tract Society*, and at the Eastern end, Bangalore Library, Mayo Hall*, Public Offices*, and Gymkhana Pavillion* (now become the RSI Officers Mess) (* - Buildings that are Still existing). 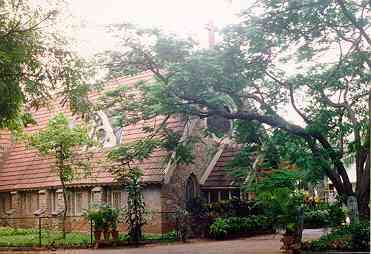 There were six European Schools and two European Colleges in Bangalore, for the education of the Anglo-Indian and European boys and girls. Three were for girls and three for boys. There were also a few private Mission Schools , and quite a lot of schools for the European Community. St. Joseph's College on Residency was the prime First Grade College under the University of Madras, and was housed in a three storied building. The ground floor was occupied by Chemistry and Language Departments. Rooms were also reserved for B.A. English and History Departments. On the first floor was the Principal's Office ( earlier known as Residence), the Library, the College Offices, the Intermediate English lecture rooms, and the Physics lecture rooms and Laboratory. On the second floor were the Professors' Room, the Mathematics and Intermediate History lecture rooms, and the College Hall which was used for examinations and composition work. A Reading and Common Room for students was provided in the vicinity of the Library. The College Hostel on Residency Road, just a few minutes' walk from the College, provided accommodation for European and Local students. The Principal of the College was the Warden of the Hostel also. Apart from English, in the 1920's the College offered instruction in the following languages and subjects - for the Intermediate Course and B.A. (Honors) Degree Course - French, Sanskrit, Tamil, Telugu, Kanarese; Mathematics, Physics, Chemistry, Economics, Ancient History, Modern History and Logic. The Physics and Chemistry Laboratories were well equipped with water, gas and electricity. The Library contained over 4000 volumes. Ample provision was made for games of which the Physical Director of the College, held a Diploma in Physical Education was the Superintendent. 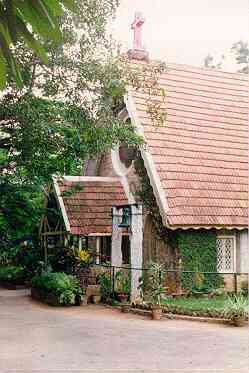 The College was under the management of the Roman Catholic Mission of Mysore - The French Foreign Mission, and was open to students of all communities without distinction. In 1929, there were 280 students in the Intermediate and B.A. classes of whom 18 were ladies. 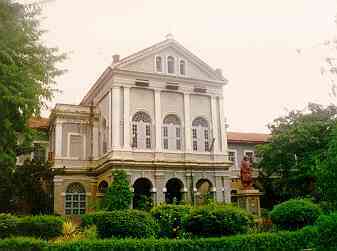 In 1939, the College was handed over to the Jesuits. There were two schools attached to this College, the European Section ( originally called St. Joseph's European High School, today it is known as St. Joseph's Boys High School) built in the form of the letter H. It prepared students for High School and Cambridge examinations. It accommodated 300 boarders in the upper dormitories. It had a beautiful Chapel. The School was founded in 1865. It was said that great care was taken to impart to the pupils a sound moral training, to improve their minds, and hearts, to inculcate in them gentlemanly manners and habits of regularity and cleanliness. In short to prepare them for the duties of after school. Two large and open play-grounds afford ample space for cricket, football, hockey, tennis, badminton and other games and exercises. One was situated on the School premises. The other, a much larger field called "New Field" near the United Breweries. Great attention was paid to physical training and games apart from studies. The School possessed a Cadet Platoon and a Boy Scouts' Troop (some of the photographs are available at the School's Old Boys' Office). The other school was the Indian Section ( St. Joseph's Indian High School) and was in the 1920's a three storied building on Museum Road. It educated Indian boys irrespective of caste or creed up to the school final course of the Madras University and had accommodation of upto a 100 students. Attached to this school was the St. Louis' Boarding House, which housed for a small sum the boys from this school. It had a playground of six acres in the bed of Old Shoolay Tank ( today this is the St. Joseph's Commerce College premises). The School has moved to the New Field Grounds new Cubbon Park. The College and the Schools were managed by the Society of French Foreign Missions of which the Superior was the famous Abbe' Dubois. For History click on St. Joseph's Colleges and Schools, and the Jesuits. This Church is situated on Hosur (Hoosur) Road in Richmond Town . The Church was built in 1870. An English built Pipe Organ was erected in August 1905. A Parsonage was also attached to it. The Institute is located on the junction of Alexander Street and Wellington Street. It was originally a grant from the military authorities for the use of pensioners as Reading Room. When that was given up, the building was used as Armoury for Volunteers who vacated on constructing their own building. In 1901 the All Saints' Incumbent, Canon Foley was given the same by the then Resident, Mr. Robertson and it was used as the Church Institute for young people and a place of meeting for parishioners. In 1908 under Rev. Walsh a Reading Room and Library was organised by the men's society and in 1911 it was handed over to the Church Committee who manage the affairs of the Institute and it is now in a very flourishing condition. In 1912 the building was enlarged and electric lights installed. There is a stage and for a small fee it is let out for concerts and other entertainment. The Building in all respects fulfills the intention of the donors because the Civil and Military pensioners freely use the Institute; besides being the favourite resort of the young for games, meetings and concerts. The Institute was also known as the Richmond Institute, and today Frank Anthony Junior School runs on the premises, and also extends to the next plot which belonged to Mr. Moore. All Saint's Church in the midst of trees, and a stately profile. A little walk down Hosur Road will take you past the Bangalore Military School, Johnson Market, and Baldwin Boys' School. The School is on Hosur Road, Richmond Town. It is a Boarding School belonging to the Methodist Episcopal Mission. The chief features are a laboratory, large dormitory and two big halls. Students are prepared for High School and Cambridge Examinations. The School was established in 1880 by Bishop Oldham. The buildings were erected by liberal donations from Mr. Baldwin of U.S.A. The Institution is managed by a Board of Governors. A brief History. The School has now opened a Junior College section a few years ago. This remarkable institution stands on Hosur Road. It is maintained by voluntary subscriptions and is managed by the Roman Catholic Order of Nuns known as "Little Sisters of the Poor ". It is a home for the destitute, aged, poor and infirm who are over 60 years of age and who seek its shelter. All persons irrespective of caste and creed are admitted to the Home. The inmates number about 140 in the late 1920's. Today the numbers have grown, and a new block is under construction on the North side along the wall of Baldwin Boys' High School. History. Similar Institutions could be found on Glory. The Park is situated to the South -West of Richmond Town along Kingston Road. It provided and still provides a necessary recreation ground for the young and old of the locality. There was a Bandstand and a band occasionally played at the Park. There are paths neatly laid out and had pretty flower beds. It is certainly a credit to the Municipality that what was once a tank has now been converted into a beautiful park. Today the Park is used very much by the local residents for morning exercise, and in the evenings for children to play. The garden has always been well maintained with pretty flower beds neatly arranged. A fountain was later constructed in the centre of the Park, and a new stage towards the North-West section was built. It is used quite frequently for dramas and musical evenings. The School is on Richmond Road at it's Western end. The School was established in 1879 and was managed by the same Board which controlled the Boys' School. It was attached to the Methodist Episcopal Church on Myrtle Lane. It has commodious premises, large class-rooms and upstair dormitories. In the 1920's there was accommodation for 100 Boarders and 100 Day scholars. The girls were prepared from Kindergarten to High School and Cambridge Examinations. Special attention was paid to music, drawing, dress-making, ample scope for tennis, badminton, and basket-ball. Attention was paid to the intellectual, physical and moral training of the girls and in every way it provided a thorough education for European and Anglo-Indian children. History. The Cemeteries are to the South of Richmond Town on the Hosur (or Hosoor) Road. Protestant and Catholic Cemeteries are side by side. In the centre of the Old Protestant Cemetery stands a tall monument erected to the officers and men of 16th Queen's Lancers who died in India. In the 1920's, the walks and gardens were well kept. Today this Old Cemetery is neglected and full of bushes and snakes, and the graves cannot be reached for fear of being bitten. In the Cemetery a portion was assigned to each denomination. The New Protestant Cemetery on the opposite side of the road facing the Catholic and Old Protestant Cemeteries is very large and is very well maintained. The South section of the Old Cemetery is said to be still used. In the Roman Catholic Cemetery are some fine and handsome tombstones, some leading back to 1877. 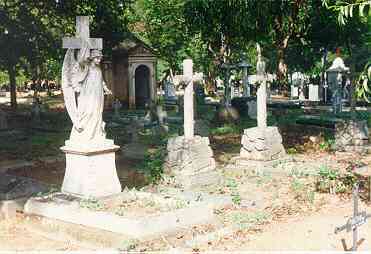 The Cemetery is maintained by St. Patrick's Church. The present Supervisor is Mr. Adams, and Members of the Cemetery Committee are Sydney Mendens (Incharge), Major Cherian and Ronnie Johnson, besides the Parish Priest. Graves & more graves. Request is made to families having deceased relations buried in the cemetery to pay Rs.100/- per year towards the Cemetery & Grave maintenance. Encouraged by Mr. Austin, the Collector and Municipal President, the Municipality had built in the 1920's a number of small cottages in Austin Town for the benefit of the poorer classes. These cottages with two and three rooms were rented for nominal sums. They were in great demand by poor Anglo-Indians and Indians. Compared to the regular private houses these could be called "Huts". The adjacent locality was mainly the abode of servants who were working in Shoolay. The neighbouring areas were Neelasandra, Agram and Vannarpet. These houses are still occupied by descendants of the original occupants. Some of the Other Sites recommended to a visitor to Bangalore Civil and Military Station in the 1920's . In the North-West Sector - The Mysore Maharaja's Palace, Palace Orchard, Palace Race Course, Palace Polo Ground, Mysore Transport Lines, Mysore Lancers' Lines, Kaiser-i-Hind Mills, Hebbal Experimental Farm, Kempe Gowda Tower, Sandalwood Oil Factory, Jewel Fitters, Hebbal Rifle Range and the world famous Tata's Indian Institute of Science. In the West Sector - The Golf Course, Race Course (opposite the West End Hotel), Central Jail (opposite the Race Course), Central College, Meteorological Observatory, Health Institute, Mythic Society ( a new block has been built behind Daly Hall), Cubbon Park Band Stand, Sir Mark Cubbon's statue, Mysore Public Offices (now Karnataka Government Offices, High Court known as the Attara Kacheri), Sheshadri Iyer Memorial Hall and Public Library (a circular red building in Cubbon Park) , Mysore Government Museum (on Kasturba Road), Cenotaph (Not to be seen), St. Martha's Hospital, Municipal Offices, Daly Memorial Hall. In the East Sector - Whitefield , also further East about 70 miles is the Kolar Gold Mines generally referred to as K.G.F., said to be one of the deepest mines in the world. On South Parade, Brigade Road, St. Mark's Road and Commercial Street, back in the early 1920's "Where You could Buy What!!" One of the biggest shopping complex on Brigade Road in the 1920's was the "Campbell Building" at No. 7, Brigade Road. This building house quite a number of Shops and Establishments. To start with, there was Campbell & Sons (Estd. 1895), Electricians (by Appointment to His Excellency the Rt. Hon. The baron Hardrige of Penshurst), Tile and Stone Merchants, dealing with Mangalore pattern tiles, roofing, flooring, ceiling tiles manufactured by the famous Basel Mission at Mangalore, Hardwood Door Handles, famous House & Commission Agents with the motto "Build, Buy, Sell, Let, Repair, Improve or Electric-Light a Bungalow! ", Campbell also was able to supply you with a "private' Telephone connection at home besides doing Printing jobs. Brigade Road also had the pick of shops dealing with vehicles, one could pick up from F.T. Peters & Co., automobile parts or get carriages built (those days a Rickshaw with rubber tyres cost Rs.250/- while one with Iron tyres cost Rs.200/- !). and get the tyres fixed by a then new process of vulcanizing called the "Harvey Frost" process. Here one could pick up the speedy "Velocette" motorcycle. Being decked up with top-hats and high collars, and ladies with their plumed hats and fancy millinery, a quick nip into Dalley's Studio at 7A Campbell Building for a soft-edged portrait in amber bromides, those visiting from K.G.F. patronised this popular photographer. Gentle & Co. at 7C Campbell Building had a specialist French engineer L.Duchamp who was an expert on automobile lighting and "magneto-electricity"!. The Brigade Stores also was in the same Building, and sold wines, cigars and cigarettes. Ali Mohamed & Brother, a General Merchant and Dress Maker has a shop at No.7, and deals in Millinery, Haberdashery, Draperies, and Hosiery items. 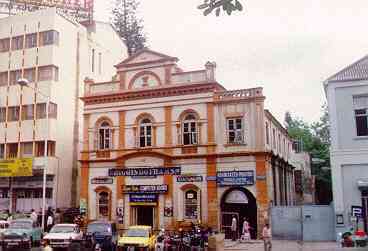 The Bangalore Pharmaceutical Company, was the Chemist, Druggist and Optometrist at Campbell Building. Furniture, new and hired could be got at The Victory Furnishing House at No.111 Brigade Road. If you wanted a custom carriage or a special designed wrought iron gate or a garden bench, you could get it at G. Swasbrook at No. 12. Looking for a cold beer and a round of billiards you could step into 'Ye Olde Bulle & Bushe'. Turning off Brigade Road, one can divert into a quiet section of this Town and find R.A. Thompson, B.A., Law and House Agent, Conveyaner, at No.5, 'Mango Dell', Rest House Road, if one wanted some Legal work done for Sales, Mortgages and Loans. Back on Brigade Road, one can get a carriage built at The Coronation Carriage Works under M. Aga & Co., at Nos. 103-105 Brigade Road. It is possible that 'New King' built in 1901, was a garage for a carriage, because of it's appearance and shape, also being at the corner of Castle Street and Brigade Road. If your were to go further down the road, you would know surely you were heading in the wrong direction when you came to the Elgin Electric Flour Mills, a beautiful red building, alas, it's gone today, and a set of flats are coming up on the site. Another Genneral Merchant was B.V. Venkataswamy Naidu & Sons under Rao Sahib at No.10. For a more sobering thought, one could go down to No.14, Brigade Road, and order a coffin or a stone from Snaize Brothers (Estd. 1870), further down the road on Langford Road was Stableton a stone sculpturer. The Snaize Family, are the only old undertakers of the City still in business, , others have succumbed to the business itself. On South Parade, at No.1, to be more precise, one could pick up a good "Oliver" typewriter or a "Burroughs Adding & Calculating Machine" for one's Office or to be impressive and send off to England "Official" letters. In those days, people did concentrate on "Cursive" handwriting, when the "quill" gave way to the "dip-pen". The lettering was very rounded with curls and twists. A busy place was Hill's News Agency and Music Depot at No.2, South Parade. Attached was a Reading Room, Book Club, Billiard Room, all within the premises. The entrance to the Billiard Room was from Museum Road, giving us a location of the building. If one wanted to buy silks, carpets and other hosiery items, A. Lavender & Co. at Prince of Wales Building was just the place. (Mr. Lavender who owned the enterprise also was in the hotel business, and had a beautiful hotel on Cubbon Road. Today it is totally annihilated by the road that connects Raj Bhavan Road with Infantry Road at the junction of Capitol Hotel, Coffee Board, & Visveswaraya Centre, New GPO Building.) The officers got their personal vehicles serviced at the Military Garage at No.37 South Parade, which also sold tyres and tubes and did vulcanizing work, while their cars or bikes were being serviced, they could go next door to the Bangalore Photo Stores at No.36, and pick up film or leave film for processing, or get components for Kodak cameras, this was situated negr the Wesleyan Soldiers Home ( close to the Mayo Hall end of the road). Down towards Agram through Brunton or Primrose Roads, one came across M/s. George Hall, Army Merchants and this concern was adjacent to Cornwallis, More House & Pekin Barracks. A couple of names crop up one S.Shamsuddeen & Co. Army Contractors, dealers in Mineral Waters, Bread, Pastry, Italian & French Confectioners; then there was Marlam & Co well known as watchmakers and jewelers; L.A. Pourwal & Co., General Merchants and Wholesale dealers in piece goods of the Buckingham, Carnatic, Bangalore Wollen Cotton and Silk Mills (Binny's). The Royal Dispensary under Shrieves & Co. (Estd. 1886) were well known dispensing Chemists and druggists. Off South Parade and parallel to St. Mark's Road one finds Jules Phaure, the oldest Land (House Estate) and Commission Agent in Bangalore, at No.11, Museum Road. If you wanted to buy something or sell something, the best place you could go to was Abraham & Co. the pioneer Auctioneers of the "Station" at No.1 South Parade, Furnature could be hired or sold, Trollies and Hackney Carriages hired, House & Estate Agency also thrown in, and if you were going out of the Station for some time, they would store your personal effects, one is not too sure how 'personal' the effects could be, for many a Tommy never returned to collect his 'effects'! Spencers & Co. Ltd., close to the Crystal Palace Theater, dealt with cars like the Chandler car, Saxon, Brical, Maxwell, and also Michelin Tyres. They also stocked grease and lubricants under the trade name of 'Gargoyle'!, and sold the famous 'Coventry' Eagle cycles. A big shop for the ladies was the Indian Silk Depot, under the management of V.K. Chandumal, which stocked Indian, Chinese, Japanese, Burmese silks, and C(K)ashmiri Shawls, and Curios to match the silks. With the amount of activity on South Parade, and the headbanging at Funnells, there was ample scope of a number of chemists, one could step into J.B. Forester & Co. (not to be mixed up with the Bold & Beautiful!) for some relief. At one end of South Parade, is St. Mark's Road, which had a large shopping complex at the now "India Garage" Building. At the corner of South parade and St. Mark's Road stands a gaunt looking stone building belonging to the Oriental Life Assurance Company Limited. which had it's H.O. 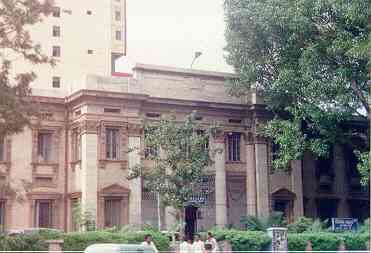 at Bombay (Mumbai), the Chief was R. Patterson Brown and the Bangalore Branch was run by P.V. Subramonier. Opposite to Bowring Institute and a little to the left as you come out of the main gate, you could come to Addison & Co., where one could get Bicycles (brands like Triumph, BSA, Humber, Sunbeam, Kynoch, Invicta, Popular, Lenton, Royalty and Cadby, also Lucas accessories), Cars (brands like Overland, Buick, Crossley, Humber, Sizaire, Berwick and Recitroen, Peugeot and Standard), Motorcycles (brands like Triumph, BSA, P&M, Sunbeam, Douglas, Harley Davidson, ABC, Invicta and Revere), and other Business like Stationery, Printing, sale of Watches, Typewriters, cyclostyles and letterpress, the Office is still existing today, but the business may be different. Close to this was A.P. Butler & Co. who sold Boots and Shoes. There were two types of 'boots' Army Surplus and Riding or fancy boots. There were also many schools and grounds for riding in those days, and even to ride a 'hackney', one required one as part of the dress code. The long shopping arcade of the now India Garage building, was called the 'Cash Bazaar', and one could pick up a hackney carriage from The Cash Bazaar Carriage Works, on the Madras Bank Road which joins Museum Road and St. Mark's Road., perhaps this Enterprise moved up from Carriages to Motor vehicles, or one could even get a decent suit tailored at Ahmed & Co in the same building. Further up and over the hump past the Parade Grounds, into Blackpully, one came into the areas of Russel Market and Commercial Street. If one needed to get in touch with the wholesale merchants, this was the area, cheaper then Brigade Road and St. Mark's Road shopping areas. One could pick up watches, clocks, jewelry, inks, get electroplating work done at Saliah's Warehouse , 155 Commercial Street. Even in those days, there were many shops in this area. One of the old time General and Wine Merchants was C.V. Pyneandy Chetty & Son at No.6 . Sports goods could be had at The Best House at No.11, which sold cricket bats, hockey sticks, imported Duke & Son (of Penshurst) cricket and hockey balls. The factory was located at Sialkot City and they had a branch at Colombo, Ceylon (today known as Sri Lanka). The Firm of B. Sreeramulu Chetty & Sons at 'City Hall', No.4, Commercial Street, was said to be one of the oldest in the City, and were dedicated Wine Merchants. The English Emporium at 'Mysore Hall' opposite Commercial Street sold hosiery, shoes, postcards of Bangalore and surrounding areas, ideal for the visitor. If one needed a Monocle, or a pair of spectacles or even Musical Instruments, one could step into V.M. Jaganath & Brothers, Consulting Opticians, at No.13, Commercial Street. Shopping or getting things done in other places other than the above favorite areas, one could get a car repaired at The Bangalore Automobiles, at No.8, St. John's Road; or maybe after having had some problem with the car and your clothes got all greasy, there was still hope at T.G. Bailey & Co., who were Proprietor of the 'Poineer' Steam Dye Works at No.4, St. John's Road, where Flannels, lace, 'Ostrich' feathers, Boas, fans, and delicate items of ladies could be repaired and cleaned, a special offer - 'goods for mourning promptly executed! '; or if one needed to get a piano repaired or tuned, go to N.W. Jones, late of Misquith & Co., at No.5, Wellington Street. Looking after the needs of St. John's Road and Cantonment Railway Station areas, was Hitchcock & Co., a Despensing Chemist at No.3, Cockburn Road, who had specialties like Household Balm, Household 'Embrocation', 'Neurette' Tablets, 'Cold' Tablets, Throat Pastilles, hair Cream, Paraffin for hair, besides the Chemists line, they were Sole Agents for the tea from the Carolina Tea Estate. Closer into 'Town' on 25A, Cubbon Road, one could get tasty confectioneries and food from J.W. Smith. If You were to visit Bangalore in the "Good Old Days" ... Around the end of the 1920's ... Where Would You Stay? If You were to visit Bangalore in the "Good Old Days" ... Around the end of the 1920's ... What Would You See? 'The Works' of Bangalore walla! Thought for the Day: "Be still, and know I am God; I will be exalted amoung the nations, I will be exalted in the earth! Psalms:46:10, Holy Bible.